Gayatri Karandikar, WG’19, spent a summer at PepsiCo as a global strategy intern, reflecting on oats, healthy food innovation, and cultural awareness as she combines her passion for nutrition with global business knowledge. Gayatri Karandikar, WG’19, was eager to adopt a healthier lifestyle when she left her hometown of Hong Kong to attend university in California. Healthy food and nutritional balance became a part of her daily routine, and as a full-time management consultant, she prepared healthy snacks for her weekly flights. 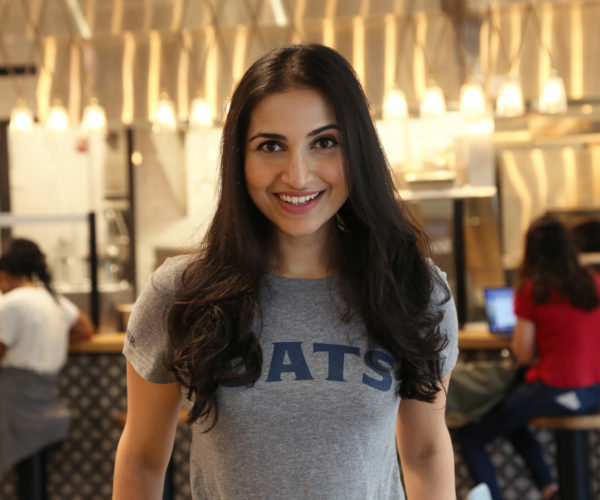 When Gayatri wanted to integrate her personal and professional passions, she turned to the Wharton MBA program to gain a strategic business education and exposure to the packaged healthy food industry. Since every person defines health differently, Gayatri believes that a successful formula of food science research, consumer education, and product innovation — what she calls the “three legs” that build the foundation of a nutritious product — can connect consumers to foods that work for both their taste buds and their bodies. Now, she’s incorporating nutrition into her curriculum. Last semester, she consulted a local food startup for an Innovation and Product Design course, and this semester, she will be creating a healthy food product campaign in Entrepreneurial Marketing. By accessing electives at other Penn schools, Gayatri was the only MBA in Nursing 112, “Nutrition Science and Application,” where she deepened her prior understanding of the field and learned how to optimize her own diet. Last fall, Gayatri represented Wharton in PepsiCo’s 2017 Invitational Marketing and Finance Case Competition, collaborating on a snack and beverage business innovation idea with students from other B-schools. She then pursued a global strategy internship at PepsiCo, and spent the past few months with the nutrition team examining ways to grow Quaker Oats in global markets, where oats are not a part of the local breakfast culture. While her consulting skills came in useful in crafting compelling stories and financial models, lessons from her business classes were an important supplement. Gayatri once considered becoming a nutritionist, before realizing she loves the business side of nutrition as much as she does delving into scientific research papers. In addition to thinking about products, branding, and marketing, she’s particularly invested in women’s health and making nutrition more accessible. Born in Wisconsin to parents from Pune, India, Gayatri spent part of her childhood living on the container ship where her father worked as a merchant navy captain, before her family relocated to Hong Kong. She identifies as a “third culture kid” and finds the experience has made it easier for her to empathize with the global consumer and their divergent needs. Gayatri draws on her personal background to bring cultural awareness to her work, but her interest in bridging different perspectives extends to her extracurriculars. In Dance Studio, for example, she nurtures a passion for dancing that came from loving Bollywood and engaging with her Indian heritage. As a Diversity Admissions Fellow, Communications Fellow, and Leadership Fellow, Gayatri is also dedicated to increasing diversity and inclusion on campus, keeping the Wharton community a welcoming place for all kinds of students. She’s happy to have had the opportunity to lead pre-term for first-year MBAs, serving as a teaching assistant for Prof. Adam Grant’s teamwork and leadership course through the McNulty Leadership Program.